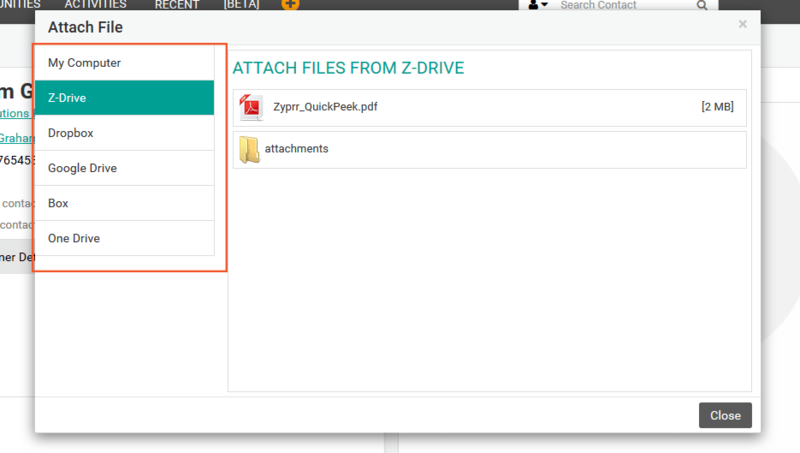 While sending an email you can attach files from different sources to any email initiated from ZipperAgent. Similarly, you can also attach customer documents to a customer record itself. ZipperAgent provides a Documents tab on the details page of each record. You can see list of already added documents to the record, you can attach or remove any file to this record. You need to open email composer to create an email. You can click on any email id of any record to open the email composer or click on the Compose button on the Email list page. To attach a file to this email, click on the small clip icon at the left bottom part of the email composer. The attachment dialog opens with default file source selected as “My Computer” on the left side bar. Use the “Choose Files” button on right top corner to choose file from your computer's local drives. 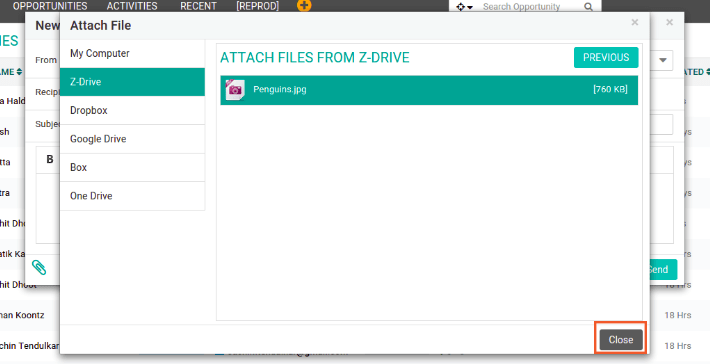 You can upload files from various external source such as Dropbox/ Google Drive/Box/ One Drive. Your account on these sources need to be integrated with your ZipperAgent account. If any of the external resources are not integrated with your ZipperAgent account, a prompt will ask you to integrate the same right there. 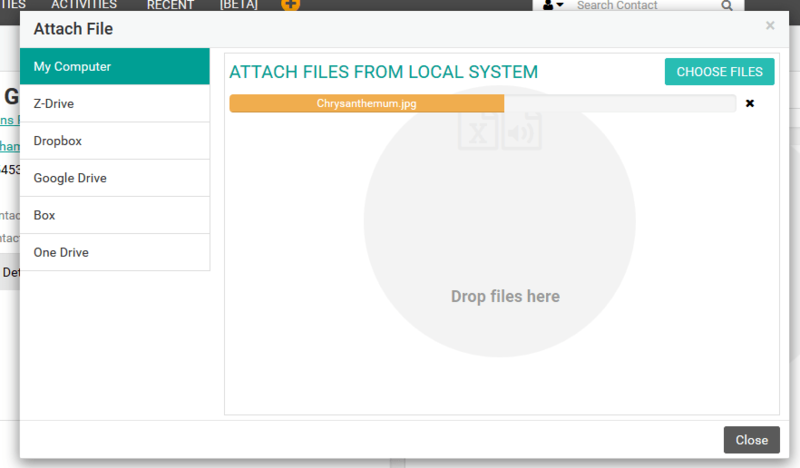 You may choose to drag and drop file inside the designated “drop files here” space at the middle of the attachment dialog. Once you select the files to upload, click on the close button to close the window. 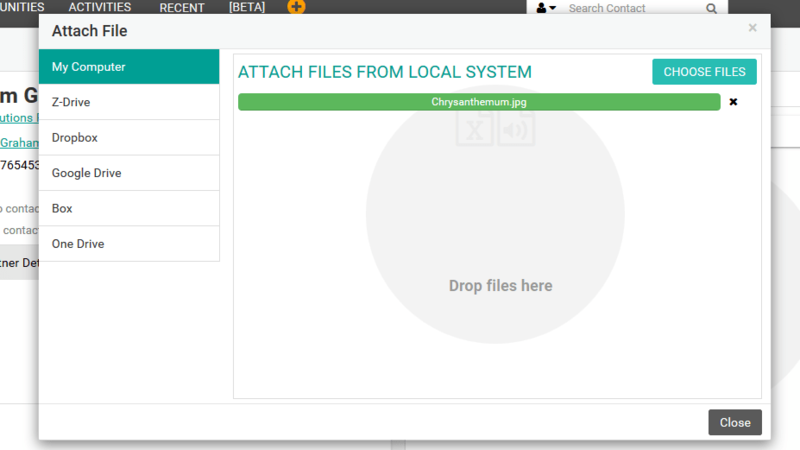 Attached files will appear at the bottom of the email editor. 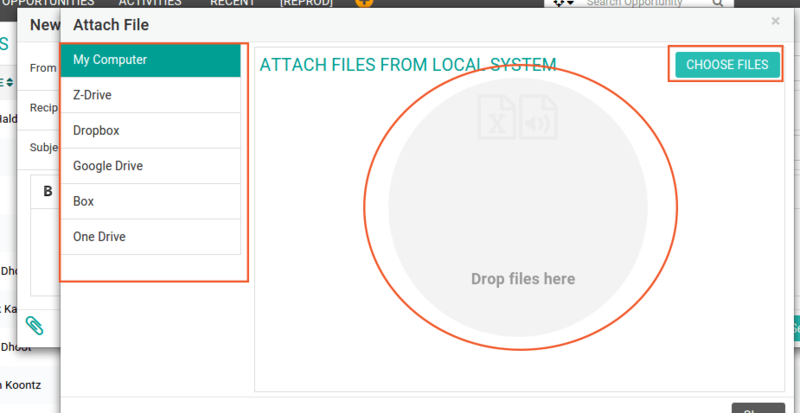 You can attach multiple files and delete already attached files by hovering the pointer on the attachment name and clicking on the 'X' button. You can download attached files by hovering the mouse pointer on the attachment name and clicking on the download icon. Note: Number of files to be attached and total allowed size of attachments in an email, depends on your type of paid subscription. While on the list page of a record such as Contact/Opportunity/Property/Account, click the name of the record to open its detail view. Click “More” button on right top corner of the detail page to expand the detail of this record and also see all associated detail information of this record. Click on the “Documents” tab on the right hand side of record detail page. Note: If any of the listed external document services are not integrated with ZipperAgent and you are trying to upload file from that source, a message is prompted to create the integration first. Once you have chosen the files to be attached, it will show you a progress of the file uploading process. Once upload in completed, click on the Close button to close the file upload window. The newly added files will be listed on the Documents tab along with the file name and size. You can also download the added files from Documents tab by clicking on the download icon, beside the delete icon. You can delete files from this record by clicking on the delete icon on right end of each file added.